MacWorld is more than new and recycled computer products, of course. It is an Event, with parts of it as well-scripted as a spontaneous demonstration at a political convention. 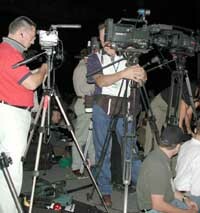 The Event is centered on the script; the audience (customers, investors) is secondary to the cameras (or, in this case, the satellite broadcast and Webcast audience). Take, for example, the keynote address. Apple invited members of the media, stock analysts, celebrities, and VIPs to the keynote. 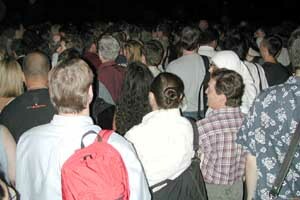 If you fell into one of these groups, you were instructed to go to a pavilion just north of the Javits Center. Once there, you milled around for a while, trying to figure out which color-coded type of VIP you were. 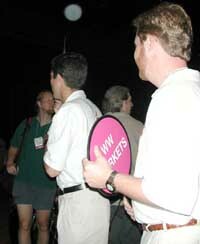 There were lots of different colors, each associated with signs with odd abbreviations, and most of the VIPs were segregated into their own holding pens. Apple employees and volunteers sometimes held up signs to assist the color-coded VIPs find their fellow color-coded peers, but most of the time forgot. I wandered into dozens of people I've met over the years; in one random gathering, the five participants had five unique colors on their badges. Since we all had similar backgrounds, we couldn't figure out why one person had a black VIP ribbon, one a green, one a red, one a blue, and one a lavender. After lining up at the wrong doors, the mass of VIPs -- hundreds of Very Important People, as rare a breed as rabbits, apparently -- were ushered up and down various flights of steps, and into the darkened hall set up for the keynote. The volunteers and Apple employees occasionally waved their color-coded signs, mostly to indicate that, no matter where you were, your color-coded section was on the opposite side of the hall, located behind pillars, or a stand for video cameras, or a bunch of people who didn't have chairs and decided to stand in front of you. While Apple has many engineers who have studied queuing theory, none of them, obviously, were involved in planning the keynote. Before the keynote opened, "the media" set up shop on several raised platforms in the keynote hall. These platforms were placed strategically in front of several sections of VIPs, many of whom wondered aloud if there were any "UIPs" (Un-Important People) in the hall, and if they had better seating. Then the scripted portion began. Steve Jobs did his usual excellent job of hosting the keynote, complete with new product introductions, previews of coming Apple commercials and revivals of old commercials, software demos, and general cheerleading. After a while, even those who groused about being herded like cattle and branded like preschoolers started to smile, applaud and generally get into the spirit of the event. Then Steve Jobs announced that every seat in the hall had, taped to the bottom, a cardboard Apple logo, good for one brand-new Apple Pro Mouse. 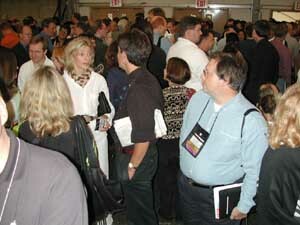 Given that these were august VIPs, many of them multimillionaires, or famous journalists, or influential stock analysts, or jaded network managers, the audience responded with appropriate grace and dignity: hundreds of people erupted out of their chairs and dived for the floor, scrambling for the cards. Sadly, it was a bit too dark to catch on film, and the media cameras were pointed at the stage. When Steve Jobs announced that each chair in the hall had a cardboard Apple logo good for one Apple Pro Mouse, hundreds of people dived for the floor, scrambling to find the cardboard logos. Then they jammed the sides of the room, where Apple employees traded cards for mice.